### Who is to blame for this? The project was originally created and maintained by David Joffe (~1994 to 2004, and Oct 2016 to present). It was maintained by EMH (Evil Mr Henry http://www.emhsoft.com/) from 2004 to 2008. Additional contributions by: [T.O.G](http://www.nuke24.net/ "T.O.G. "), [Vytautas Shaltenis](https://rtfb.lt/), Kent Mein, Steve Merrifield, Felix Richter, Kevin Joffe. See also 'Additional Credits' below. 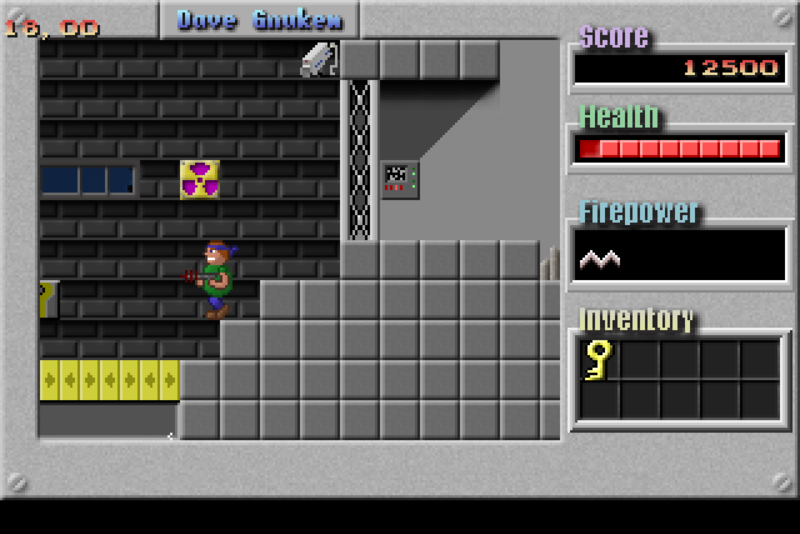 Duke Nukem 1 was a famous original 16-color 320x200 'classic' game released by Apogee Software in 1991 that launched the Duke Nukem series: https://goo.gl/yP4PbS The original Duke Nukem 1 was created by Todd Replogle (co-creator of the Duke Nukem series), John Carmack (of id Software), Scott Miller (founder of 3D Realms), Allen H. Blum III, George Broussard, and Jim Norwood. Try find the exit, while dodging or shooting monsters. To open doors, find the correct color key, and press the action key on the 'lock' nearby the door(s). Power boots allow you to jump higher. The special molecule pickup gives you full health. The year is $CURRENTYEAR+8. An evil genius, Dr Proetton, has been hired by the CIA to infect the world's computers with a virus called SystemD, crippling them. Only you can stop him. You must find the floppy disk with the Devuan Antivirus on it, and install it on the master computer, which is hidden in Vault7. * Visual Studio 2010 project is included. Same as Linux - type 'make'. Run with ./davegnukem if it built correctly. Dependencies: You may have to first install LibSDL1.2 and LibSDL-Mixer1.2 (these can be installed by downloading the source code and doing 'make' and 'make install' (as root) for each of these first). Note there is currently no 'undo', so be careful. If happy with a set of work, save your changes. * M,N: Previous/Next spriteset. There is a left-click and right-click "sprite palette"; clicking the left or right mouse button in the map preview area places an object from the left-click or right-click palette, respectively. Click in the spriteset with the left or mouse button to select that sprite object to either the left or right-click "sprite palette". * To select the hero start position in the map, select and place either the 2nd-last or 3rd-last object in the first spriteset (it looks like a figure with a left or right arrow, which indicates the start direction). There should only be one of these per level. * To place the exit position in the map, select and place the last object in the first spritset. There should only be one of these per level. * 1-9: Macros: Float the mouse cursor in the map preview area and press one of these shortcuts to place from a few pre-defined complex objects, e.g. crates. Note that for active animated objects that consist in the spriteset of multiple sprites (e.g. each conveyor belt piece has 4 sprites, for its animation), you *must* place the *first* of the four in the map for the object to work correctly. Keep in mind that once the hero has the powerboots, he'll be able to jump higher. So there is a sort of logical progression if you place powerboots in a level, i.e. they should be placed once per 'mission' (i.e. set of levels), and levels prior to that should assume the default lower jump height, levels after that point might possibly assume the higher jump height. To add a new 'mission' (i.e. set of levels), edit the missions.txt file and add a new line containing the name of your .gam file, e.g. "mygame/mygame.gam" (without quotes). (You should try keep all files associated with a particular game/mission in its own subfolder.) To add/remove levels for that game/mission, edit the .gam file (see the included .gam files to see the format). * Fix up and update credits etc. * Signed executables in binary release? * Is the -640 flag now basically obsolete? Remove? Or change to do something else useful? E.g. to make window maximum size e.g. same as monitor could be useful for level editing. * ? Make a list of 'level TODOs' that are must-have for a 'version 1'? 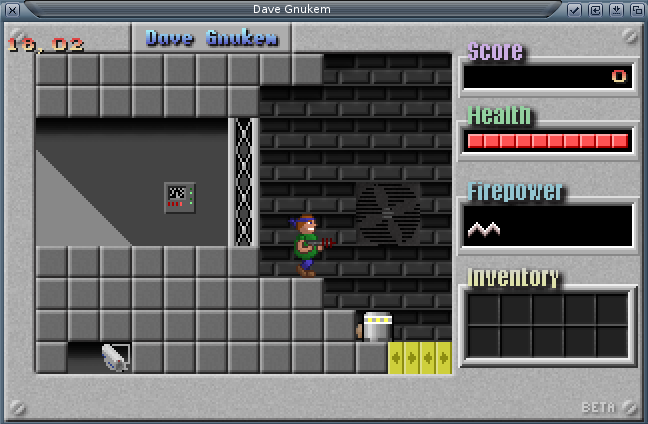 The name is a pun on 'Duke Nukem' and 'Gnu' as a sort of 'hat-tip'/reference to the open source license/model. The game took forever to complete to mimic the Duke Nukem Forever model of taking forever to be released. 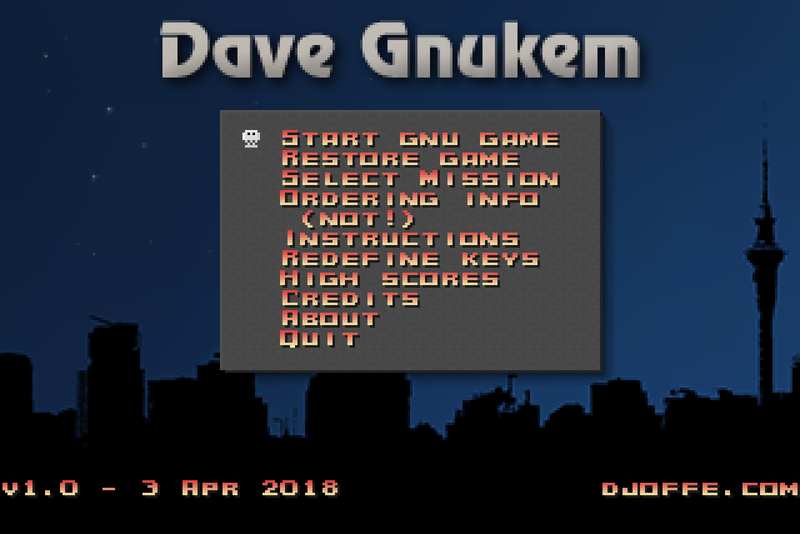 The source code itself (and most of the data/sprites) for Dave Gnukem are dual-licensed under MIT license or GPL. Apart from the abovementioned, all other data included with 'version 1' is dual-licensed under MIT license or GPL.